In our homeland's case, we can not afford a "balanced" approach to history since in the past and present years, our homeland's history, as it refers to Philippine-US relationships, has been imbalanced in favor of the Americans, who as far as we baby boomers can remember, are only "the good guys" and "do-gooders" in history.It is time for us, especially for Filipinos-in-the-Philippines to recover our history, a nationalist history, which necessitates uncovering the lies and myths about America; since the American arrival into and 50-year occupation of our homeland, the sweet nothings about "Philippine-American Special Relations", etc. 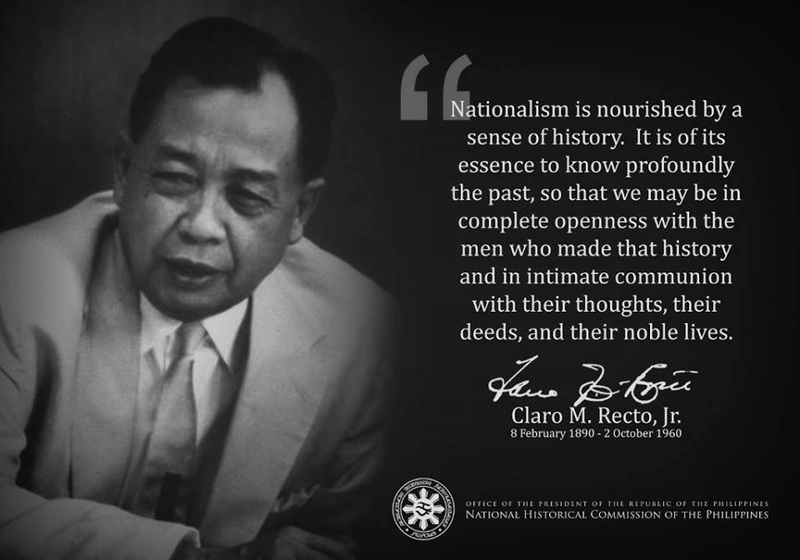 perpetuated through our school textbooks, mass media, government pronouncements, Filipinos with Americanized minds, etc. We Filipinos, here and abroad, past and present, relied and continue to use official explanations that lead only to our ignorance of hidden truths and knowledge of untruths, thus perpetuating the post-WW2 neocolonial conditions that brought only worsening impoverishment to the Malay Filipino majority; foreign control of the national economy and the dwindling of our national patrimony. Manila, in the Philippines, provided the front and back covers for the Spanish-American War. It was in this harbor that the opening shots of the 106-day war were fired by the ships of Commodore Dewey on May 1st. On August 13th Admiral Dewey's ships fired the closing volley that signaled the end of the Spanish Empire. In the 104 days between, almost all of the combat was waged half-a-world away in the Caribbean. When the sun set on the evening of May 1, 1898 Manila Harbor was still filled with smoke--all that remained of a once mighty Spanish Naval squadron. The defeat was unprecedented, Dewey accomplishing what few could have dreamed possible, and all without the loss of a single life (save for the heat stroke victim). It would be however, a full week before officials in Washington, DC would hear the details of the American victory. Early on, the Spanish Governor-General mistakenly thought the smoke of battle near Cavite in Manila Bay signified a Spanish victory, and cabled this welcome news to Madrid via the underwater telegraph that was Manila's only link to the outside world. On the morning of May 2nd, Commodore Dewey notified this Spanish official that, since that cable was INDEED the only way communications could be sent from Manila, it should be considered NEUTRAL so that he could use it as well. When the Governor-General refused, Dewey dispatched his sailors to dredge up and cut the cable, ending the direct flow of information out of the Philippines. It was the first step in what would have been, but for the later loss of American lives, a comedy of errors. None would speculate on Dewey's post-victory plans in Manila in their stories. Upon arrival in Hong Kong, Consul General Wildman took a steam launch to the McCulloch to ferry the new arrivals to shore. Even before the launch could tie up at the docks, Harden and Stickney were leaping ashore and racing for the telegraph office. The younger Harden took a shortcut, arriving only minutes before Stickney. While the clerk protested the lengthy (3,000 word) dispatch, Stickney arrived and went directly to the manager's office. Stickney's observance of office protocol earned the loyalty of the manager, who ruled that the first dispatch would the the Herald's. Harden protested, ordering dispatches to the general manager of the telegraph lines in London requesting the immediate dismissal of the Hong Kong office manager. The clerk refused to send Harden's complaint to the general manager after noting that it was NOT a WAR DISPATCH. The crafty Harden finally resorted to bribery, informing the office manager he would pay for his dispatches in cash...at a rate THREE TIMES the commercial rate and NINE TIMES the press rate. The bribe worked, and the office manager ruled that Harden's dispatch to the Tribune would go first, followed by Stickney's dispatch, and finally McCutcheon's. In keeping with the conditions imposed by Commodore Dewey, Harden advised the clerk that Lieutenant Brumby's dispatches must preceded them all, and specified that these official dispatches must be repeated. Harden's instructions were in keeping with the LETTER of the conditions, though not the spirit. In requiring that Dewey's dispatches be repeated, it mean delays at each of the six relay stations between Hong Kong and the U.S. Capitol. At the first relay station, Harden's report of the battle passed the official report of Lieutenant Brumbly, arriving between 3 and 4 A.M. (hours ahead of everyone else), just in time to make the morning editions. Within days of Dewey's victory in Manila Bay, the harbor was crowded with the vessels of several foreign nations, most conspicuously those of Britain, Germany, France, and Japan. These came under the pretext of guarding the safety of their own citizens inside the city of Manila, but with a keen eye on the methods and activities of the American Naval commander. The foremost question in the minds of these observers, was what the Commodore would do next. Back in the United States the media had given the impression that Dewey had conquered Manila, and that the Philippines were now under American control. The truth of the matter was far different. While Commodore Dewey had indeed utterly destroyed the Spanish fleet, his control extended only across the harbor. More than 15,000 Spanish soldiers still garrisoned the city itself. For the next three months, Dewey was contented to blockade the harbor, cutting this force off from the rest of the world. Ironically, Dewey's own blockade placed him in a similar position...cut off 7,000 miles from home and with not means of immediate communications (after having destroyed the only telegraph cable out of Manila). On May 11th, the same day that the first and only Naval officer to die in the war was killed at Cienfuegos, Cuba, Dewey was promoted to rear admiral. Two days later, as Commodore Schley's "Flying Squadron" departed Hampton Roads for Cuba, Admiral Dewey informed Washington, DC that he would require 5,000 ground troops to capture Manila. The Army was quick to respond, marshaling a force near San Francisco that would become the Eighth Army under Major General Wesley Merritt. The Eighth Army commander was a West Point graduate who had seen distinguished action in the Civil War and then served on the frontiers of the American West. In 1882 he returned to the Academy to serve as its superintendent, until called back into active duty to command the ground forces in the Philippine Islands. While awaiting the arrival of ground troops, Admiral Dewey contented himself with his impressive Naval blockade of the city. On the deck of his flagship USS Olympia, he welcomed aboard members of the media clamoring for interviews, and watched the goings on aboard the numerous vessels of other foreign nations as they arrived almost daily. He also encouraged the return to the islands of a revered local freedom fighter, a man author Mark Twain would call The George Washington of the Philippines. Born in Cavite, Aguinaldo grew up among the elite, the son of the Mayor of Kawit (Cavite viejo). In 1895, twelve years after his father's death, Emilio Aguinaldo became mayor of Kawit. The following year a major revolt against Spanish rule erupted in the Philippines, and Emilio Aguinaldo joined the secret, nationalist brotherhood Katipunan founded by revolutionary leader Andres Bonifacio. Ultimately, Bonifacio and Aguinaldo clashed and, in 1897 Aguinaldo ordered the arrest and eventual execution of Bonifacio. As the revolt against Spanish rule faltered, Aguinaldo entered into an agreement with the Spanish rulers whereby he allowed himself to be exiled to Hong Kong in exchange for a payment of 400,000 pesos. Aguinaldo was in Hong Kong, reportedly using that money to purchase arms for future battles against the Spanish, when Commodore Dewey sailed out on his own conquest. Aguinaldo returned to his homeland with encouragement from Dewey, even meeting with the Admiral aboard his flagship shortly after his return. Years later in U.S. Senate hearings, Admiral Dewey testified, "I never treated him (Aguinaldo) as an ally, except to assist me in my operations against the Spaniards." That assistance came very close to ending the Spanish rule in the Philippines ahead of Admiral Dewey's schedule. Emilio Aguinaldo returned to his native island on May 19th, and quickly began assembling a force of patriotic insurgents to roust the Spaniards. The 29-year old freedom fighter believed that the American Naval forces in Manila Bay provided him a tenuous ally that would finally enable his people to rid their country of Spanish rule. Though Admiral Dewey refused to provide either arms or support for the ground campaign, Aguinaldo believed the Americans were his friends and allies in the effort to win Philippine Independence. Towards that end, he was determined to do his part. Dewey had Manila blockaded by sea, and within two weeks Aguinaldo's insurgent force of 20,000 Filipinos moved within a few miles of the city to surround it with 14 miles of well placed trenches and fortifications. On June 12th Aguinaldo declared Philippine Independence and proclaimed himself President. Planning for the ground offensive Admiral Dewey had requested against Manila began at the Palace Hotel in San Francisco, where Major General Merritt was building his Eighth Army. Like the forces that were preparing for battle in the Caribbean, his own force would be composed of four separate elements that would depart for combat in the Philippines over a 5 week period. In contrast to the deployments on the east coast, the departures from San Francisco were orderly and with great fanfare from the local populace. On May 25th Brigadier General Thomas Anderson steamed out of San Francisco with the First Philippine Expeditionary Force, 117 officers in command of 2,382 men. En route to Manila, the convoy made a brief detour when Commander Glass entered the harbor at Apra to claim the Island of Guam for the United States. Following the bloodless conquest, the six transport ships continued towards Manila. Meanwhile, on June 1st, Civil War hero Arthur MacArthur was promoted to Brigadier General and placed in command of several volunteer regiments training near San Francisco. It was a force numbering nearly 5,000 soldiers. On June 15th the Second Philippine Expeditionary Force, more than 3,500 men under Brigadier General Francis Green, departed San Francisco. MacArthur's Third Philippine Expeditionary Force followed twelve days later, just ahead of General Merritt and his staff. While awaiting the arrival of General Merritt's Eight Army, the greatest problem Admiral Dewey faced was in keeping Aguinaldo and his insurgent forces from taking control of Manila. Though the insurgents saw the Americans as allies in their dream of Philippine Independence, political factions were at work to thwart them. "Consistently I have refrained from assisting him (Aguinaldo) in any way with the force under my command, and on several occasions I have declined requests that I should do so, telling him the squadron could not act until the arrival of the United States troops. At the same time I have given him to understand that I consider insurgents as friends, being opposed to a common enemy...My relations with him are cordial, but I am not in his confidence. The United States has not been bound in any way to assist insurgents by any act or promises, and he is not, to my knowledge, committed to assist us. I believe he expects to capture Manila without my assistance, but (I) doubt (the insurgent's) ability, they not yet having many guns." In truth, the 15,000 Spanish soldiers now trapped inside Manila were almost as eager for the arrival of American ground forces as was Admiral Dewey. They knew the American forces to be civilized, even generous to their enemies. After the Battle of Manila Bay Commodore Dewey had wired President McKinley to announce, "I am assisting in protecting the Spanish sick and wounded. Two hundred and fifty sick and wounded are in hospital within our lines." For centuries the Spanish had ruled the Philippines with a heavy--often deadly--hand. They considered the Filipino people to be ruthless, uncivilized, and sub-human. There was great fear that if the city fell to Aguinaldo and his insurgent forces, there would be hell to pay. "Soon after the victory of May 1...General Don Basilio Augustin Davila (the Spanish Commander), through the British consul, Mr. Rawson-Walker, had intimated to me his willingness to surrender to our squadron. But at that time I could not entertain the proposition because I had no force with which to occupy the city, and I would not for a moment consider the possibility of turning it over to the undisciplined insurgents, who, I feared, might wreak their vengeance upon the Spaniards and indulge in a carnival of loot." Spanish officials in Madrid had reached the same conclusion as had Admiral Dewey regarding General Don Basilio Augustin Davila's leanings toward surrender, and replaced him with General Firmin Jaudenes during the period when the American ground forces were en route to Manila. Despite this effort to save the city, defeat was inevitable. General Jaudenes was nearly as predisposed to the inevitable surrender as had been his predecessor. Manila was cut off by sea to the west, and surrounded by insurgent forces landward. General Anderson arrived to unload his nearly 2,500 soldiers at the captured Spanish arsenal on Cavite early in July. On July 17th General Green arrived with the Second Philippine Expeditionary Force of Merritt's Eight Army, deploying his 3,500 soldiers near a peanut field just south of Manila at a site named Camp Dewey. His position was within range of the Spanish guns, but the enemy withheld its fire, fearing that any offensive action would bring swift and devastating return fire from Admiral Dewey's ships, just off shore. General Merritt arrived on July 25th, just ahead of the MacArthur's Third Expeditionary Force which had been delayed in transit by rough weather. He promptly took command of the ground war, planning with Admiral Dewey for the fall of Manila. Neither gave recognition to Aguinaldo, or included him in the military preparations. "I did not consider it wise to hold any direct communication with the insurgent leader (Aguinaldo) until I should be in possession of the city of Manila, especially as I would not until then be in a position to issue a proclamation to enforce my authority, in event that his pretensions should clash with my designs. For these reasons the preparations for the attack on the city were pressed and military operations conducted without reference to the situation of the insurgent forces." In the closing days of July, General MacArthur's Brigade joined the rest of Merritt's force, bringing the total American troop strength to more than 10,000 soldiers, amassed only a few miles south of the Walled City of Manila at Camp Dewey. To the east, Aguinaldo waited impatiently with his force of 20,000 insurgents, eager to attack and claim the Philippine Capital. General Jaudenes and his 15,000 Spanish defenders were completely cut off, surrounded, and running out of food and supplies. It was reported that some in the city resorted to eating rats to fill their empty bellies. General Jaudenes knew that defeat was imminent, but the Spanish were proud traditionalists at warfare, and the beleaguered commander was determined NOT to surrender his city to the "savage and uncivilized forces" under Aguinaldo. Between Manila and General Merritt's three brigades at Camp Dewey sat the seaside guardhouse of Fort San Antonio de Abad, just two miles south of the city. The Spanish trenches stretched eastward towards Blockhouse #4, with the insurgent forces in full command to the east. The arriving American soldiers moved into some of the insurgent positions between Camp Dewey and the Spanish lines in the closing days of July, bringing them directly under the enemy guns. There was only sporadic fire from the Spanish artillery as the newly arrived American forces came ashore to dig trenches and prepare for the coming assault. On the night of July 31st, the American forces could restrain their fire no longer. The one-and-a-half hour battle that followed pitted the infantry and artillery fire of the two opposing forces against each other in what became the deadliest battle in the Pacific. When the Americans returned fire, their positions were exposed and the Spanish adjusted their fire, resulting in 10 Americans killed and 33 wounded. The following day, Admiral Dewey suggested that the Americans hold their fire in the coming days as General Merritt continued to deploy his forces for a final assault. "(It is) Better to have small losses, night after night, in the trenches, than to run the risk of greater losses by premature attack," he cautioned. In the days that followed, Merritt's forces continued to land and take up positions. The First Colorado Volunteer Infantry moved their own lines eastward to the Pasay Road approaching Manila from the east. Their work was arduous, fighting swamps, monsoon rains, and intermittent enemy fire. At night the Spanish guns continued to fire on American positions, resulting in 5 more deaths and 10 Americans wounded. On August 7th Admiral Dewey sent a message to General Jaudenes warning that unless he orderd his soldiers to stop firing on American positions, the U.S. Naval commander would turn the big guns of his ships on the city within 48 hours. Intermittent rain had fallen throughout the night as the soldiers at Camp Dewey shook off the early morning chill and prepared to move north. It was 7:30 A.M. and the battle for Manila had commenced. During the darkness of the previous night, American engineers had crept through the area cutting holes in the enemy's barbed wire to permit passage. Now, General MacArthur's 1st Brigade began its movement towards the enemy positions on the road leading to Pasi. The terrain was swampy, the roads muddy, but by 8:05 that morning most of the elements had reached their forward positions and taken shelter for the opening volley. Less than a mile to the west, General Greene's 2nd Brigade was making its advance along the beach. Leading the way was the 1st Colorado Volunteer Infantry, followed by volunteers from California, Nebraska, Utah, Pennsylvania, and Oregon. Ahead lay the enemy fortification at Malate, Fort San Antonio de Abad. At 8:45 the nervous young soldiers, about to face their first test of offensive combat actions, noted the movement of Admiral Dewey's ships in the harbor to their left. The large war ships began positioning themselves for the attack. At 9:45 the big guns boomed, and large shells began raining down on the Fort at Malate. There was only sporadic and light return fire, and the young Americans advanced nervously to capture the fort. As they neared its now badly scarred walls, the naval bombardment stopped. Cautiously approaching, the young soldiers of the 1st Colorado found Fort San Antonio de Abad deserted, save for two dead and one wounded Spaniard. Quickly the Americans took control of the abandoned enemy stronghold, looking off towards the east where at 10:30 General MacArthur's brigade had noted the end of the naval bombardment and begun moving again towards Manila. At 10:35 Captain Alexander M. Brooks of Denver, Colorado raised the Stars and Stripes over the captured fort. It seemed that the long awaited assault to capture the city of Manila was going to be an easy task. So far, there were no American casualties. It was an unqualified victory...but then it should have been. This was a battle that, unknown to but a few of the higher ranking commanders, had been carefully scripted. Before the first shot had been fired, the events had already been scripted, and the outcome determined. Inside the walled city of Manila, General Jaudenes listened to the sound of the naval gunfire. He wasn't concerned. He had already agreed with Admiral Dewey as to how the scenario would play out. On his desk was a piece of paper, the only printed document related to the unfolding events. It sketched out a series of signal flags that, when seen flying from Admiral Dewey's ship, would indicate that it was time for the Spanish commander to order his men to hoist the while sheet over the city that would signify the final act in the mock battle for Manila. It would be a disgraceful act for the Spanish commander to give up his city without a fight. Such an act would be received with derision and probably court martial upon his return to his homeland. The Spanish were still quite fearful of the consequences if the city fell to Aguinaldo and his band of Filipino insurgents. Resolution of such matters were carefully crafted through the Belgium consul Edouard Andre. In its final draft, the carefully choreographed sequence of events called for the initial shelling of the fort at Malate, which would be promptly abandoned by its defenders. As the Americans then began their ground advance, Admiral Dewey would bring his ships before the city and hoist the signal flags demanding surrender. Upon seeing these, General Jaudenes would order the while flag raised, and the Americans would enter. As had been the case in Cuba, the word "surrender" was avoided to be replaced by the term "capitulation." The capitulation of Manila would transfer control to the invading American forces, which would then secure the city and deny entrance to the insurgent forces under Aguinaldo. The brief, bloodless battle at San Antonio de Abad would save face for the Spanish soldiers and their commander, demonstrating that they had capitulated ONLY after a devastating attack. It was an unusual strategy by two opposing forces, one which would not only save face for the Spaniards, but would also save lives for BOTH sides. In the swamps and jungles to the east of the city, the guerilla fighters of Emilio Aguinaldo could hear the sounds of the early morning naval bombardment, and greeted the sound with optimism and hope. For weeks they had been poised to take the city and end Spanish rule of their homeland, held in check only at the insistence of the American commanders. As the bombardment ended and the American forces continued north in two columns, the insurgents raced to join the battle. The 1st Colorado lead General Greene's brigade along the beach and past Malate. Meanwhile, in the east, MacArthur's brigade moved through the Spanish trenches, past Blockhouse #4, and towards the Spanish position at Blockhouse #20 near Cingalon. When the 13th Minnesota approached, the Spanish defenders fired a few rounds in a token resistance. It was met by a similarly light return fire from the Americans. Hearing the sound of the skirmish, the guerrillas could restrain no longer, rushing into the foray. A pitched battle ensued, the soldiers of the 13th Minnesota caught in a cross-fire between the Spaniards ahead of them and the insurgent forces behind them. Before the battle ended, five American soldiers lay dead. Thirty more were wounded. It was an unpredictable situation in the scenario, for the Filipinos had not been appraised of the script. They thought there was a REAL battle going on that would liberate their capitol. To make matters worse, they didn't want to be left out. For the rest of the afternoon the insurgents would be the wild card in the unfolding events for as General Merritt later stated: "We purposely gave the insurgents no notice of the attack on Manila, because we did not need their cooperation." Indeed, the biggest challenge facing the advancing American army was not routing the enemy from the city, but keeping Aguinaldo and the supposed Filipino allies OUT of the city. It mattered little to them that, on the eve of the battle, General Anderson had warned Aguinaldo that any of the insurgents attempting to enter Manila would be fired on by the Americans. When the skirmish at Cingalon ended, the wounded were moved into a small church for treatment, while the remainder of MacArthur's troops continued towards Manila. At 11 o'clock, as the two columns converged on the city, Admiral Dewey hoisted his signal flags to demand the Spanish surrender. Over the following tense minutes, nothing appeared to be happening. General Greene entered the city with some of his troops, riding into the Luneta...the city promenade. There he was confronted with a heavily defended barricade, and a group of Spanish soldiers who, like the insurgents, apparently were not privy to the unfolding script. Both sides faced off in a tense situation that could have turned deadly with one, mistaken pull of a trigger. In the bay, Admiral Dewey watched the minutes tick by without seeing the white flag of surrender. In the hours that followed, the Spanish and American commanders hammered out the final details of the surrender while the foot soldiers took up defensive positions in the suburbs. The 1st Colorado crossed the Pasig River to occupy the districts around San Sebastian and Sampaloc. Some small skirmishes continued from time to time during the afternoon, often precipitated by attempts from insurgent guerillas to enter the city. In the process, the Second Brigade suffered one additional soldier killed in action, 38 men wounded. By 5:30 in the evening, the fighting was over and the United States Flag flew over the capitol city of the Philippine Islands. Then again, it didn't even have to happen..... The mock battle for Manila occurred on August 13, 1898...more than 24 hours after the signing of the peace protocol in Washington, D.C. at 4:30 P.M. (5:30 A.M. Manila Time) on August 12th. Because Admiral Dewey had cut the only cable that linked Manila to the outside world, news of the war's end reached neither General Jaudenes or Admiral Dewey until August 16th. By that time, the United States Army occupied the city and had become the protectors of their former enemy, and the enemy of their former ally. Te recomiendo este diario como complemento del artículo anterior. Guerra Hispano-Norteamericana 1898. Rendición de Marianas. Capitulación de Manila. Viaje: Agaña-Cavite-Manila-Agaña, 20 de Junio al 17 de Septiembre de 1898. Memorias manuscritas que Jose Antonio y Federico Romero conservan de su abuelo José Romero Aguilar, medico militar destacado en las Marianas en las fechas que ocurrieron estos hechos. Las citadas Memorias serán el nucleo principal de este blog y se complementaran con otros escritos e información diversa. 1898 Spanish-American War. Accountability Marianas. Capitulation of Manila. Travel: Agana, Agana-Manila-Cavite, June 20 to September 17, 1898. Handwritten Memories Jose Antonio and Federico Romero kept his grandfather José Romero Aguilar, prominent military doctor in the Marianas on the dates that these events occurred. The above memories are the main core of this blog and be supplemented with other writings and miscellaneous information. To translate: cut and paste each paragraph into the Google Translator. Very easy to do. Thanks to Federico. I'm looking to buy Professional Weather Measuring Instruments. If you would have to choose any Weather Measuring Instruments for your institute, which brand would you preferred? I've heard weatherstationary provides with the best brands in a reasonable price.